Just a fraction of the talent represented at the talent show. 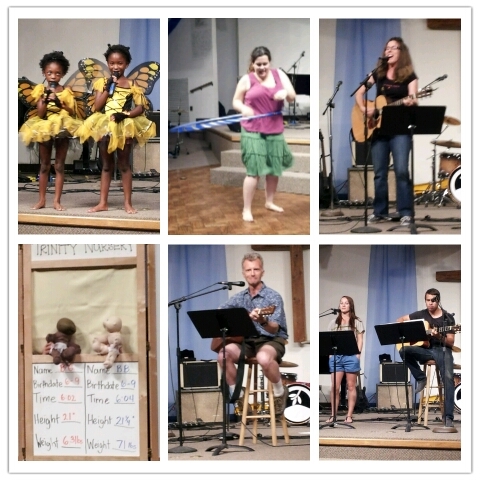 Countless thanks to all who were a part of our dessert social/talent show last Saturday. Between the friendly conversations, loads of encouragement, delicious desserts, and joyous sharing of music and gifts, it was a reminder of how incredibly lucky we are to be part of such a loving community. Fourteen days -- two weeks -- until takeoff. Sometimes it's hard to wrap my head around the enormity of the change we'll be undergoing. And really, how can we? When we moved to the Valley of the Sun just weeks after getting married in 2005, we had no idea that we would find ourselves with relationships and friends that would make or lives so abundant! All we know is we have an undeniable yearning to go, serve, and be the light in a dark world and the time to answer that call in a bigger way is upon us. But 14 days...that is something much easier to wrap the mind around. There's still a lot to do, but the end of this chapter is in sight, as is the start of the next. In the meantime, we look forward to some additional opportunities to fellowship with and support us before we leave. First, you can come see our group, The Ragamuffin Stampede, perform tomorrow (June 12) at the Trunk Space (see flyer below), Sunday, June 17, at Trinity Mennonite Church, and possibly on June 20 at Yucca Tap in Mesa.